Turtle Bay Village is superbly situated next to the crystal clear waters of the Mediterranean, with spectacular views of the impressive Five Finger Mountain Range which stretches for over 100 miles parallel to the Northern Cyprus coastline. Nearby is the village of Esentepe, a charming little village which is home to a mixture of local Turkish Cypriots and European settlers who have already realised their dream of a perfect home in the sun. Turtle Bay Village is the perfect place to relax and unwind in the sunshine and get away from the hustle and bustle of everyday living. Turtle Bay Village consists of 411 two and three bedroom apartments & penthouses. 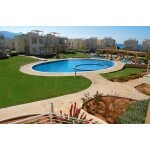 All ground floor apartments have easy access to the gardens and pool areas. First floor apartments have the added benefit of a private roof terrace. 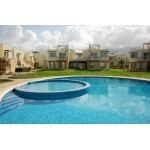 Alternatively, villas with three or four bedrooms and private gardens are also available. All of the apartments and villas are set in 100 donums (140,000 square meters) of expertly maintained gardens, with a water feature and stream running through the heart of the village. The main towns in north Cyprus are Nicosia, Farmagusta, Kyrenia and Esentepe. Kyrenia has one of the most picturesque harbours in the world, fringed with excellent restaurants and an ancient fort: it is well worth a visit. North Cyprus still one of the best kept secrets of the Mediterranean with beautiful beaches and the sea temperature rarely falling below 16°C and often rising to 28°C later in the summer. There are stunning mountains, excellent food and restaurants, friendly people and it is virtually crime-free. Mass tourism does not exist, the island enjoys over 320 days of sunshine each year and with mild winters and long hot summers, it has long been a favourite with British holiday makers looking for villas or hotels. Many of the British ways have been adopted by the government of the island including the British legal system - they even have the same electrical system using the same voltage and plugs. The cars drive on the same side of the road, which is great if you use a car hire service and although Turkish is the first language, English is the second, with many of the local people speaking English and the island attracts buyers from across the globe for both North and South. Contact us today to make an offer on this fantastic investment property boasting all year round rentals. Discount flights offered through our partners at Skyscanner.